Do you want to spoil yourself on Valentines Day? Why not get a new lampshade for your bedroom or your special space at home? 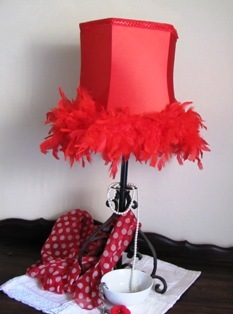 This lampshade was specially made for Valentines Day in Bright Red Satin and finished off with lush red feathers for a vibrant lovable look! It will be on sale on the Market.